Until 1978, the national color guard championship occurred in the summer at the DCI Drum and Bugle Corps Championships or at National contests of the American Legion and Veterans of Foreign Wars. In August 1977, at the DCI Championships in Denver the Guard championship was held in a basement, complete with structural columns around which the guards had to maneuver and the judges crane their necks. The lack of air conditioning was even less conducive to great performances. But, despite these obstacles, there were some excellent performances. In an extremely close contest the Holley Hawks, Holly, NY, became the national champions; defeating St. Anthony’s Imperiales after the Imperiales received a penalty for “trailing” (a flag code violation). Little did many of the people in attendance know that color guard was about to change in a major way. At that time, judges’ training, score sheets, show requirements, and even length of program times were different from one part of the country to the next. Stylistically the Eastern guards emphasized equipment, the Midwest drill, and the West dance. It was clear that the activity had outgrown the connections to summer contests so significantly outside of its “season.” It was time to create a place specifically for Winter Color Guard. 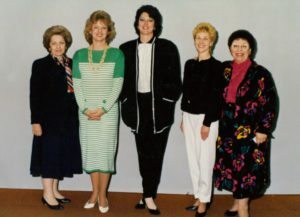 In the spring of 1977, a group of six people met in San Francisco to discuss the formation of an organization to govern the color guard activity from coast to coast. At that meeting, attendees Don Angelica, Shirlee Whitcomb, Stanley Knaub, Bryan Johnston, Marie Czapinski, and Linda Chambers introduced the name Winter Guard International (WGI). The next step, the organizational meeting, meeting was in October 1977 at the site of the DCI Rules Congress in Chicago. Many of the leading guard instructors at the time were also teaching drum corps and would already be in attendance. The meeting was an open forum for anyone to attend. Representatives of all of the established color guard circuits nationwide were invited; 13 associations attended. It was agreed that Lynn Lindstrom, the current Commander of the Midwest Color Guard Circuit, would head the newly formed organization for the first year. This became a post she subsequently held for twenty-four years. Four existing guard circuits each donated $250 to provide the initial $1,000 needed to operate that debut season. 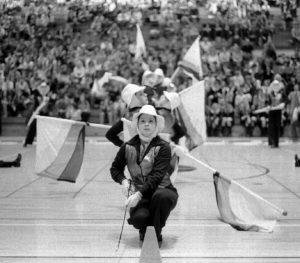 WGI in its first year was run through the color guard circuits. Three individuals shared the responsibilities of the Chief Judge position, emphasizing the importance that there was equal representation of East, West, and Midwest. The first WGI Regional schedule featured an ambitious 14 contests to be held in venues from Los Angeles to Boston. 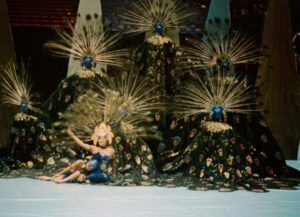 Some of the most exciting days of the color guard activity took place in the late 70s and early 80s when East, Midwest, and West came together and competed in what was then called the WGI Olympics. At that time, the South had not yet developed to the level they enjoy today. The first year there were two size floors because some regions used a 40 x 60 floor and others used a 50 x 70. Every guard carried the American Flag. Many guards carried wooden dowels with bicycle grips as simulated sabers. WGI had a volunteer staff of ten people, and executive director Lynn Lindstrom hand-sewed the championship flag herself. The preliminary contest was held at Crown High School in the Chicago area, and was attended by 29 units competing in one class. The finals contest, held at Conant HS in Hoffman Estates, IL, featured the top 15 units from the prelims contest. At that time there were two judges on the floor who recorded errors in marching and in equipment carriage. The “tick system” determined the outcome; precision and excellence were the cornerstones for success. Some infractions of rules carried a full point penalty and frequently determined the show’s outcome, and nobody debated that issue. Three GE judges shared responsibility for the subjective scoring of the effect of the program.  Shows were designed around specific requirements including Pass in Review, Standing Presentation of Colors, and Post and Retrieve. A fourth requirement, common in the East, was the Manual of Arms, but this was not included in the structure at that time. The starting line was always the perimeter of the court to the left of the audience and the finish line was to the right of the audience. Guards were required to start and conclude their shows over those two lines. A high point of each show was the 1 minute allocated to the Post and Retrieve of colors, when guards would take that opportunity to do a weapon feature; some even ventured out on to the floor for a little “drill” moment. The Timing and Penalty judge, who watched for countless potential violations of the American Legion Competitive Flag Code and adherence to Field Manual 22-5, had huge impact. Rifles weighed upwards to five pounds. Silks were often carried on six-foot poles with finial pieces, and the East dominated the world of saber technique, using genuine Spanish or German Sabers while the rest of the country played catch-up with simulated sabers. Equipment was clearly defined including the description of the rifle that had to have a bolt; optional configurations were the site, strap, trigger and trigger guard. There was a specified size for flags, and none could be larger than the National Flag whose finial piece had to be either a spear or an eagle, and if it was an eagle, the bird had to be facing toward the door. It was a time of rules and regulations and figuring out who could get around the dozens of potential penalties. From that point on, a meteoric rise occurred in the growth of this activity in artistic and competitive development. In progressive steps, the units voted to remove the requirements that had previously been the basis for how shows were constructed. The designers could no longer depend upon those components. Shows began to take on a different look, and creativity and originality became a focus for the growing WGI. Props, flats and sets found their way onto our stage, and creativity lead us to milestone discoveries. When the Board of Directors agreed that the American Flag would no longer be a required piece of equipment, the Flag Code and FM 22-5 became obsolete. From roots based in the military we grew to align our concepts with theater, dance and entertainment of a different nature. By the time the young WGI held its third Championship March 29-30, 1980, in Cape Cod, there were 60 guards from 14 states and one Canadian province competing to determine which guards were the best in Open and A Class competition. The creative change WGI experienced sparked interest and appeal in schools across America, and more and more scholastic groups formed. Two additional classes designed specifically for these new high school groups were created, expanding our classifications to 4 and dividing the competitive field to provide greater equity and opportunity. The growth continued and the number of groups increased again to a point where WGI recognized the need to accommodate this expansion and created a third level of competition. Guards could now compete in A, Open, or World classes for either independent guards or for scholastic guards. With the expansion to three classes, the scoring system was redesigned to serve the developmental progression of these groups, resulting in the three-tiered system that we use today. WGI was now firmly committed to providing a quality educational experience for its performers. Its purpose and function was focused within an educational paradigm with steps to guide and reward groups from the most basic beginning place to the ultimate world class. It offered all levels of guards the opportunity to achieve the highest recognition, honoring champions in each of the six classes. But the growth was not over. The population within the A classes required yet another level of competition specifically for those very new, young groups who would not be traveling beyond the Regional level. The outgrowth of this was the Regional A Class. In 1992 a new division joined the already thriving color guard division. Indoor Percussion competition began with six groups performing on stage in their debut season. The first Champion was Clovis West High School of California. Paralleling the growth of their sister division, percussion began growing at such a rate that their classification process paralleled that of winter guard and increased steadily to accommodate more and more percussion lines. By 1999 it offered eight classes of competition: Independent A, Open, World, Scholastic A, Open, World, and two Concert classes. Many referred to this division as “Percussion Theater.” WGI was rapidly becoming a full-service organization filling the competitive needs of both independent and scholastic units. The educational standards set forth by the Board of Directors drew respect and trust from the units, and among other pageantry organizations WGI is acknowledged as the premier leader in education. Not only do the adjudicators commit to ongoing education unparalleled anywhere in the pageantry activities, but also the competitive experience is focused on the educational development of the performers. At the urging of several members of the Board of Directors, and from other competing groups whose percussion and guard programs had flourished, WGI created the Friendship Cup competitions offering the same standards of competition and adjudication to marching bands. In January of 2003 the Marching Band division of WGI was discontinued. In 2015, WGI launched a third division – WGI Winds. Â This division includes competitions for any instrumentation of musicians in the same intimate competition setting. Â Twenty groups competed in the first WGI Winds Championships held on the Sunday following the Percussion World Championships. Â Classifications were set up to includeÂ Independent A, Open and World, as well as Scholastic A, Open and World right away. Today, that loosely woven organization that began with a simple goal, a dream, a great deal of trust and 30 color guards, now serves hundreds of guards, percussion ensembles, and winds groups. Over 500 color guards, percussion ensembles, and winds groups compete on two separate weekends for their own World Championships. Approximately 200 volunteers manage the Championship Contests that serves the over 12,000 young performers. Over 135 trained adjudicators service the guards and percussion lines during the season. Some of the same volunteers from that very first contest can still be found working at the championship contest. All three divisions have their own Advisory Boards that sets the artistic and competitive direction. They select their steering committee representatives and determine all rules and regulations. This keeps the artistic and competitive direction of the WGI in the hands of the units.